The Next Generation of Traffic Cameras and NOAA Radar app for Texas is here (This app is part of the Universal Purchase. 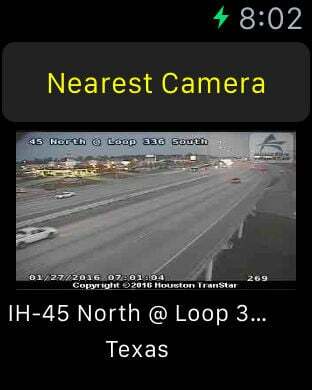 With one purchase, you will be able to see the Texas Traffic Cameras on your iOS, Watch OS and Apple TV devices.). > Radar images will be loaded when the app is launched and will be refreshed every 10 minutes. And you are ready to see the latest real time radar images on the map. Zoom in and out to see the whether across multiple states. Click on the "Radar" button to enable/disable radar images. Slide the slider to change the transparency of radar images. > Click on any traffic cameras on the map and you are ready to view traffic camera. Click on the traffic cameras button on the layer selection to enable/disable traffic cameras. > Launch the Watch App and the app will communicate with the iOS App to get the nearest Traffic Cameras information and also notify the iOS App to select and view the Traffic Cameras. Click on the "Nearest" button if you would like to search the nearest camera again. - The first app to integrate both traffic cameras and the latest national Radar images together. - The first app to provide traffic cameras and Radar images in 3D view. - One click theme switch by selecting the left sidebar and click on a theme. - One click layer switch by clicking on traffic cameras, state park, rest area and airport to turn on/off a layer.